Yes: I am going there! I am putting a stake in the ground and saying that these ten films are the ones from 1970s Hindi cinema that I would take with me to a deserted island* (*subject to change without notice). 1. Apna Desh (1972): Starring Rajesh Khanna, Mumtaz, Om Prakash, Madan Puri, Jagdeep. Directed by Jambu, music by RD Burman. in no time flat. And if that weren’t enough by itself (it is! it is!) Rajesh and Mumtaz’s electric chemistry is on full display, and the music is to die for. 2. Apradh (1972): Starring Feroz Khan, Mumtaz, Prem Chopra, Siddhu, Kuljeet, Helen, Sombrero Man. Directed by Feroz Khan, music by Kalyanji Anandji. Another two-for-one outing, with auto-racing and jewel theft against a Swiss background keeping us entertained through the first half, and India and the best lair ever through the second. Feroz is gorgeous, Mumu is gorgeous, Helen is gorgeous and a raft of scary-loony villains keep the plot ticking. Plus, one of Helen’s best songs of all time (and that is saying something) takes place in said lair. I think a simple look at her getup sums up the entire movie experience nicely. 3. Blackmail (1973): Starring Dharmendra, Rakhee, Shatrughan Sinha, Madan Puri. Directed by Vijay Anand, music by Kalyanji Anandji. Quite simply the most heart-stoppingly romantic film ever made, with one of the most romantic songs (“Pal Pal Dil Ke Paas”) ever written, in any language. 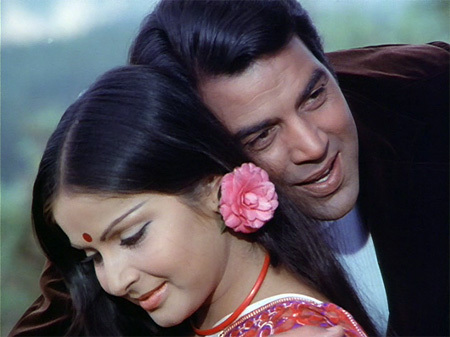 Dharmendra and Rakhee are beyond beautiful, their blossoming love story thwarted by misunderstandings, mad science and “international” villainy. I have never rooted for two people to find their way back to each other as I do for this pair. And when they do—the sparks will almost set your living room on fire! If you love romance, you will melt melt melt into a puddle. I do, every time. 4. Deewaar (1975): Starring Amitabh Bachchan, Shashi Kapoor, Nirupa Roy, Iftekhar. Directed by Yash Chopra, music by RD Burman. It is also an acting tour-de-force: Amitabh Bachchan and Shashi Kapoor will tear you apart as brothers unable to reconcile their shared but very different pasts. It’s gritty, tough, sad, and hard to watch a great deal of the time, but it is riveting and near-perfect, in my opinion. 5. Jugnu (1973): Starring Dharmendra, Hema Malini, Pran, Ajit, Prem Chopra. Directed by Pramod Chakravorty, music by SD Burman. If this film didn’t inspire Manmohan Desai as he scaled the heights of the masala genre, I would be surprised. 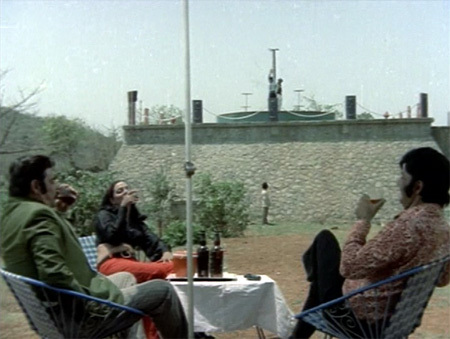 A separated family, a Robin-Hood type hero, and one of the most hilarious Masala Death Traps ever: spinning blades atop wobbly candy-striped poles fail to actually endanger Dharmendra and Pran as our villainous trio look on, cold beer in hand, from their plastic cafe table and chairs complete with umbrella. Plus, Dharmendra and Hema strike sparks off each other in a wonderful display of their famous chemistry. It is too much fun and holds a special place in my heart, being one of my early forays into the wacky world of 70s cinema. 6. Reshma Aur Shera (1971): Starring Sunil Dutt, Waheeda Rehman, Amitabh Bachchan, Rakhee, Vinod Khanna. Directed by Sunil Dutt, music by Jaidev. Sumptuously photographed in Rajasthan, this is a grim tale which condemns the cycle of violence that a culture of vengeance and machismo births. Very unusual for its time, it was a flop; Sunil Dutt lost a lot of money in the venture, but it’s by far his finest film as a producer-director and one of his finest as an actor. Amitabh Bachchan very ably plays a small but key character in one of his first roles and Waheeda is simply marvellous. It is a beautiful, powerful, tragic film (part of the tragedy is that the only dvd available is missing the key scene which leads to the climax) and it is well worth watching. The songs by Jaidev are lovely and include a qawwali where Sanjay Dutt makes his first screen appearance at the age of twelve. 7. Seeta Aur Geeta (1973): Starring Dharmendra, Hema Malini, Sanjeev Kumar. Directed by Ramesh Sippy, music by RD Burman. This movie is all about the charm of its performers and the awesome music by Panchamda. A Cinderella/twins-separated-at-birth story with Hema as the sweet, wealthy (and put-upon) Seeta and feisty village girl Geeta who comes to Seeta’s rescue unknowingly. There is nothing not to love, except the print (someone needs to restore this one, and pronto). 8. Shehzada (1972): Starring Rajesh Khanna, Rakhee, Veena. Directed by K Shanker, music by RD Burman. This is one of my favorite Rajesh films. He and Rakhee look gorgeous together and positively sizzle in a rain song that I adore, and it’s a wonderful fairy tale with engaging and real characters. Plus, Rajesh is just as charming and handsome as ever he was (and that too is saying something)…Yummy! 9. Sholay (1975): Starring Amitabh Bachchan, Dharmendra, Jaya Bhaduri Bachchan, Hema Malini, Sanjeev Kumar. Directed by Ramesh Sippy, music by RD Burman. I don’t think I can say anything about this that hasn’t already been said. Another masterpiece of story-telling from writers Salim-Javed, with great performances and skillful direction. If you have not read Anupama Chopra’s incredible book “Sholay: the Making of a Classic” you really should. Besides for Saadat Hasan Manto’s “Stars from Another Sky” and Nasreen Munni Kabir’s “Lata Mangeshkar…In Her Own Voice” you will never read a more entertaining, insightful and tastefully “gossipy” book than this. 10. Okay I’m cheating!!! Cheating Cheating Cheating! Everything Manmohan Desai made in the 1970s! Sachaa Jhutha! Shararat (please God put this on dvd with subtitles)! Bhai Ho To Aisa! Rampur Ka Lakshman! Aa Gale Lag Jaa! Roti! Dharam-Veer! Chacha Bhatija (please God put this on dvd with subtitles)! Amar Akbar Anthony! Parvarish! Suhaag! Argghhh. I just can’t keep it to ten. Posted on February 23, 2010 at 6:36 pm in Hindi movies, Memsaab's lists	| RSS feed You can skip to the end and leave a reply. “Apna Desh” was one of the firs movies that I watched in this decade. You have missed mentioning “Haathi Mere Saathi” which was a hugely popular movie among kids and grown ups alike. I notice that you have missed mentioning “Caravan” as well. You could have cheated some more ;) by mentioning “Mausam”, “Aandhi”,”Trishul”, “Golmaal”,”Chhoti si baat”, “Rajnigandha” etc etc. Hey Atul, Caravan is not from the 70s. That movies was released in 1969, so it doesn’t technically qualify as a 70s movie. Gemma loves Haathi Mere Saathi for the fellow animals, and I like it very much but it’s not a fave…and I love the music from Caravan but find the story a bit dull. Haven’t seen Mausam or Aandhi yet, Trishul is good, Golmaal too…hated Chhoti Si Baat and Rajnigandha (BO-RING). PS: Are you sure you want to watch Deewar over and over again, when you are all alone on a lonely beach, with not even good wine to keep you company? Who said there would be no wine? 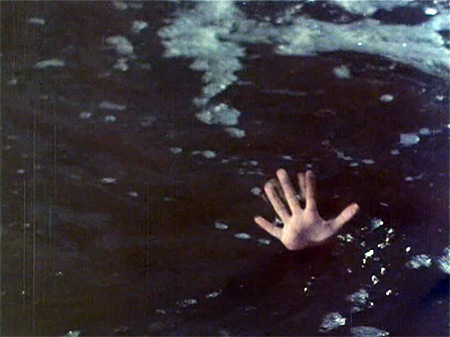 I would just drown myself if there were no wine. And yes to the Blackmail comment :) But variety is the masala of life, and Deewaar provides a good counterpoint to all that romance and lunacy. I would watch it once for every ten times I watched the others (well, Reshma Aur Shera is in the same category as Deewaar). Nice list with good explanations. Personally, I’d have to go more on the Hrishikesh Mukherjee end with Golmaal, Mili, Chupke Chupke in place of a couple of yours but you have some gems there. I also like Yadon Ki Baaraat and Hum Kisise Kum Nahin. You might sense a pattern here (I really like RD and own every one of his albums). I very much like Hrishikesh Mukherjee’s films: Mili is one of my favorites too and almost made it to the list. 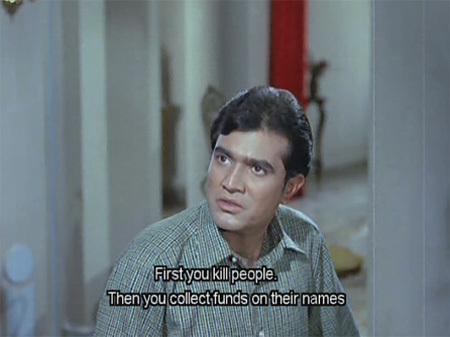 I think that the humor inherent in his use of language just goes too much over my head a lot of the time though, I know that’s true of Chupke Chupke which I really enjoyed but missed on the “funny” in large part. Also really like Yaadon Ki Baaraat and HKKN (wrote that one up here I think)…YKB almost was on the list too, because I watch that one over and over. Loafer too! First of all… BLACKMAIL! Guh! I love Rakhee. 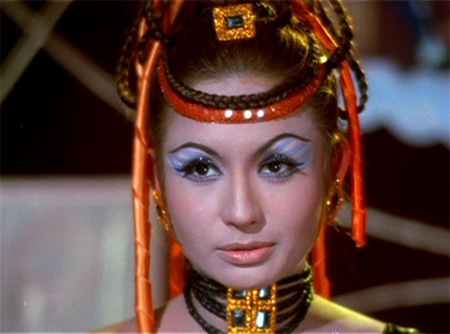 I’m surprised there is no “Sharmilee” on here but I guess there are so many amazing 1970s films…! Blackmail is just the best film ever. Ever. Ever…I would have put more Vijay Anand on here too if I hadn’t run out of numbers. Johnny Mera Naam, Tere Mere Sapne, Bullet, Chhupa Rustam…love them love them. I concur with all my heart. Even though ppl vote Deewar as the best film ever, my sneaky heart says Amar Akbar Anthony personifies all that is glorious about Hindi film industry. AAA isn’t actually my favorite MD film, although I do love it. And honestly Deewaar is one of the best films ever. It’s sad, but it is just SO GOOD. We must prevent your head from exploding. Fortunately, you don’t have to choose. You can have them ALL! (from the “More is More” school of philosophy). Aren’t we the cofounders of the More Is More school? Still, Deewaar and Sholay will definitely feature on my list too. Seeta aur Geeta is another dear favourite. But I hadn’t really heard many great things about Apna Desh (though Duniya mein Logo ko is legendary by now! ), Shehzada or Apradh. And hope to catch up on Reshma ka Shera soon. I really love Anand (and love Hrishikesh Mukherjee, see one of my comments above). But I just went with the ones that I have in a corner of my bookshelf, where I can reach them easily over and over again :) And these were them! Reshma Aur Shera is one of the most underappreciated films out there, in my opinion. It’s very powerful, and Waheeda is amazing in it. Haathi Mere Saathi was an international movie that gotten great receptions in Asia, Eastern Europe, USSR, and Latin America, but it is not the happy go lucky type that Memsaab list. It surely be on someone else list, but not Memsaab’s. We got to respect that. I am surprise that Chailla Babu is not on her list? or the colorful fashion parade Ajanabee.? Well, I do love Chailla Babu and Ajanabee. But I only had space for ten. Okay… there are a few here I haven’t got around to seeing yet (includingApna Desh, Reshma aur Shera and Apradh) – but hey, there’s the fabulous Blackmail on your list! I’d take that film with me on a desert island too! Also, as I mentioned over at bollyviewer’s, Chupke Chupke, Golmaal, Inkaar and Majboor. Well, there are a huge number of great films out there from the decade. Would love to hear your take on Reshma Aur Shera! Hee :) I’ve seen hundreds of 70s films and yet haven’t even come close to making a dent. You people who grew up with them are SO LUCKY! I’m surprised at how good-natured all of you are about my questionable taste! :) And exactly—I call them my “favorites” lists instead of “best” lists with good reason. Even I wouldn’t put some of these films on a “Best of 70s” list—but they are still favorites and I’ll watch them over some of the better ones any day. Memsaab you have impeccable taste. I am one of those who loves a tight script and good direction. I have seen quite a few films from your list. I would love to see Reshma aur Shera. I remember seeing chacha Bhatija yrs ago – good masala movie – didn’t know it was a MD movie. Dharmendra and Randhir Kapoor were chacha and bhatija respectively. LOL at number 10!!! Really enjoyed reading this… there were so many great films in the 70s! I am so pleased to see my guy making several appearances on your list! DG khush hua. Dharmendra OWNED the 70s (okay, and Amitabh and Rajesh too). I could watch Garam Dharam in just about anything and enjoy it. I have seen all these movies – and with the exception of Reshma Aur Shera, remember them fairly well. I saw RAS as a very young boy and have completely forgotten the story. Agree with almost all of them – and I can understand why you do not really enjoy Basu Chatterjee movies (Chhoti Si Baat types) much. They are far removed from glitz and glamour – and not everybody digs Indian attempt at comedy. Fair enough. A lot of it is exaggerated anyway. I think my top-10 would include some more Rajesh. Maybe Dushman, Aan Milo Sajna, Roti…not for the storyline or anything but just for Rajesh, Mumu, Asha Parekh. Mera Gaon Mera Desh was pretty good too – maybe worth an honorable mention. I would also have Caravan – I can watch this movie any number of times. Of Amitabh movies of the decade, I liked Majboor, Trishul, AAA and Don. And of course Deewar and Sholay. Got to give you credit for coming up with a top-10 list at all. I just cannot come up with one. P.S : If you want to stay away from the big names and dip your feet in some of the lesser-known movies of the decade (and yet not be Basu Chatterjee-d or Gulzar-ed) you may want to try Rafoo Chakkar or Do Jhoot. I don’t think it’s so much that I don’t like Indian comedy as much as I often don’t “get” it. A lot of it seems very regional, and language-culture based (naturally enough) and it doesn’t translate for me. I admit that Basu Chatterjee’s films are too slow for me too. I never liked Merchant-Ivory films for the same reason (Shyam Benegal too). I know—it’s heresy!!! MGMD almost made it to the list as well. I love that film. So did Don. There’s too much goodness to choose from! I just got Rafoo Chakkar based on Beth’s review, and can’t wait to see it. Will look for Do Jhoot! Not liking Merchant-Ivory a heresy ? Or Shyam Benegal for that matter ? Not a heresy at all. I am totally with you on this. M-I were too slow and arty for me too. So was Benegal. I used to run miles from such “art” movies as a boy. I remember seeing Ankur and Nishant at that time and not understanding what was going on. I saw these very same movies recently again and found them OK. But I still did not get all the major excitement about such movies. The stories were pretty ordinary, though the direction was probably of high-quality. OK, so they show rural India and social practices that Indians should not be particularly proud of. So ? It is not like this is new to Indians, it is not like the movie challenges anything, it is not like the movie even suggests or recommends anything. I remember Nargis Dutt (when she was a member of Parliament, not too long before her death) criticizing “art” movies for always showing the bad side of India. She was criticized for this, for not accepting reality. Rubbish. Nargis was very grounded and said it as she saw it. Later on, Naseeruddin Shah (and even Smita Patil) would say much the same thing. If an “art” movie comes up with a strong message I can still understand. If it is there just as a piece of art, fine. It will have its followers (to each his own, I always say) – I may even watch it and appreciate it as a piece of art – but I am not going to go ga-ga over it. Basu Chatterjee does not fall in this category. His movies were totally timepass, sweet movies made usually without the biggest stars of the time. But you are right – they were contextual and one would be able to appreciate them better if one understood the context. e.g. Chhoti Si Baat has a lot of Bombay day-to-day scenes, listening to cricket commentary in the office and stuff like that. :-) All this makes the movie endearing for locals but may not have quite the same impact for others. I might actually surprise people with my 80s film choices…there were some very good “art” movies made then. Two of the funniest films I have ever seen were made then, Chashme Buddoor and Jaane Bhi Do Yaaron. But yes, it’s a much slimmer pickings as a decade than the 70s and earlier are. 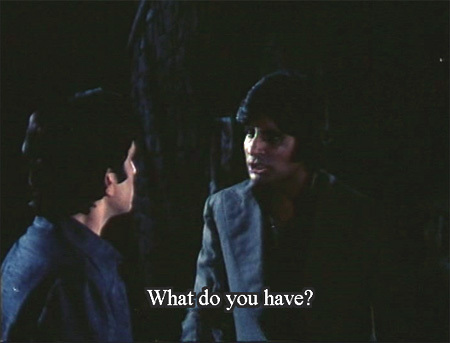 Hmm…Chashme Baddoor, Jaane Bhi Do Yaaron…two of my all-time favourite movies. I don’t consider them “art” movies. An art movie is one where milk is shown boiling in a pot on a slow flame for 5 minutes..you are shown all those 5 minutes…you wait and wait..then the milk overflows. That is a metaphor for “the situation has now gone out of control…there is something going to happen now in the story”…and you wait. Again. THat milk pot is life, Raja! Haven’t seen Pather Panchali though I’ve heard of it from my very young days. I think I have seen Kalyug…although I might be thinking of something else. And I always love watching Smita Patil, she was just fabulous. 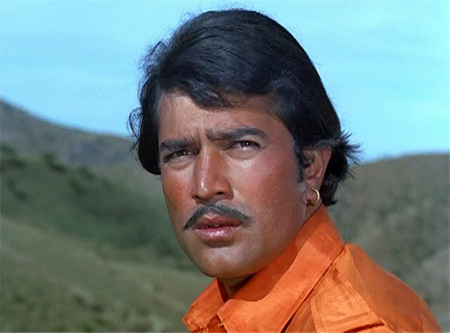 Shehzada was one of the super hit movie during 1972 of Super Star Rajesh Khanna’s . Here are the songs on youtube. Apna Desh was super hit movie of 1972 a great entertainer. 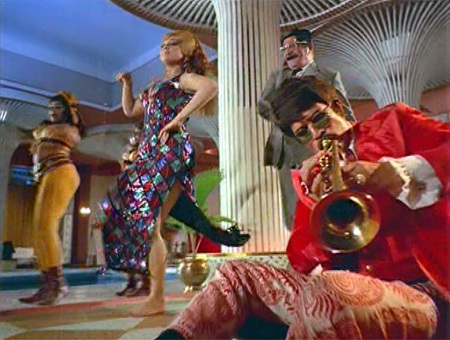 It has comedy, action, romance and to top it all fantastic music by R D Burman. The issues raised in the movie were true then and are still ruining our county. The movie had excellent support from Mumtaj, Omprakash, Madan Puri, Kanhaiyalall, Manmohan Krishna and Jagdeep. And Super Star Rajesh Khanna was of course there right on top. Its a really uncommon song sequence on the part of Super Rajesh Khanna from his Silver Jubilee Hit Film Apna Desh. With a label of non-dancer star, he performed in this most fast track song sequence superbly, ofcourse along with the equal ability on the part of Mumtaz. Duniya Mein Logon Ko – Super hit song till today. Star cast : Super Star Rajesh Khanna. Sorry, that was a bit tasteless. Anyway, I realized I really have to watch Blackmail now, I think it was Bollyviewer from Old is Gold who put it on her best of list yesterday. And Reshma aur Shera sounds really interesting. It’s maybe actually easier to pick favorites when you’ve seen a lot of them—you get a sense of the ones you go back to over and over again then. Reshma Aur Shera is very sad, but it’s wonderful. And Blackmail…well, words fail me. Just see it. Am totally on board with the Shehzada love and Blackmail and Apna Desh and Sholay. But *gasp*, haven’t seen ANY of the others, not even Deewar! What kind of a B’wood oldies aficianado does that make me? A fake is what. You are not a fake, but a very hyper-specific B’wood Rajesh Khanna oldies aficionado. And very very good at that! Am glad to see other Rajesh fans here. I have always been a massive Rajesh fan. So much so that I hated it when people began saying that Rajesh was “gone” and it was now Amitabh. Some were even talking about Shatru. I watched Sholay for the first time only in 1983. And Deewar for the first time only in 1992. This was one way of supporting Rajesh – as if to say, I will not watch those superhit movies that made your competitor take over your #1 position. Not that I have anything against Amitabh but I loved Rajesh’s romantic movies, heroines, songs et al. Amitabh came in with his “angry young man” image and spoilt it all for me. I love Amitabh too. He made some great films. I feel no need to choose but that’s probably a function of age more than anything else. I remember arguing ferociously with my brother as a teenager over music. you must have started understanding a fair bit of hindi now? Well, first of all a confession. When I saw the title of the article and then the screen shot with the hand, I was all ready to read it with my head shaking and *chuck*ing ! But hey, you have nearly the same list of fav 70s list film as I would have!!!! It moved me to tears! I am already to hug you with tears in my eyes like Dharam does it in his inimitable style, as he would hug his long-lost-now-found sister! > I’m no shrinking cinema-bahen! I’m sighing today for the umpteenth time! Simply great! heartily agree memsaab. heartily agree. I’ve just scanned the list and it was nice to see RKs handsome face show up. I’m surprised you didn’t put your Roti here. I too see these movies on a regular basis–they run in the background while I am doing boring computer work. Needless to say, I am very unproductive. Sorry Roti is there. I actually really like your list. I haven’t seen Reshma aur Shera and maybe I’d swap Mera Gaon mera desh for it. Don’t know. I love MGMD. But Reshma Aur Shera is special—very out of the ordinary, and very progressive for its time I think. On youtube but I know you don’t like that. LOL about your #10: I can totally identify with you! (Although not about 70s films, about which I remain woefully uneducated through experience.) I have Blackmail creeping up my queue, and I can’t wait! Bump it to the top!!! BUMP IT! Your choice is great and I agree iwth most of them. Rajesh Khanna. Can’t disappoint Shammi Kappor – one of his best. I love this list! Apna Desh bring back lots of childhood memories for me. I don’t remember the movie but we all know THE song. One 70s movie I would add to the list is Ishq Par Zor Nahin with Sadhana and Dharmendra. I loved Sadhana in this movie but the songs are unfortettable. In my opinion the most romantic song ever, in any language, is Yeh Dil Deewana Hai from this movie. I don’t think I’ve seen that, will look for it. Sadhana and Dharmendra….yes! They both look and act great in the movie. Your list really gave me some movies that I have to go find and watch. Couldn’t find Black Mail on Netflix so I will have to find that elsewhere. Thanks again and I love the blog and the lists! Because Amar Akbar Anthony was one of the very first Hindi films I saw, and it blew my mind so completely that I have to have more, more, more…I’m still not satisfied!…it has to be my top 70s movie. 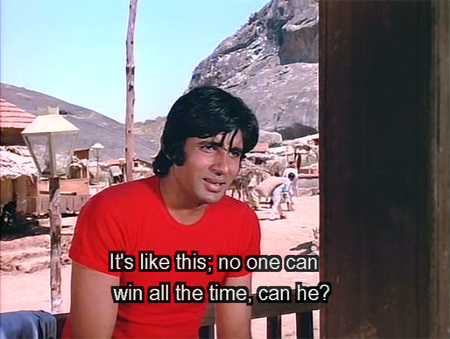 Even though I love Don and Sholay and have watched them almost as many times. Like a motherless baby goose looking for a parent, I imprinted on Amitabh, and nobody else (in the 70s) will do. I have never even heard of ‘Blackmail’. How did this happen? I am bewildered especially after you say it’s the most romantic movie ever. This must be rectified. I am going to find this movie asap!!!!! You will thank me Pitu, you will thank me. Your list is reminder of why I & the family stopped going to the cinema in 70s, except for Sholay and a few others. Reshma & Shera, Zanjeer would be there. My own list would include stuff like Abhimaan, Uphaar, Mili, Koshish, Garam Hava, Kora Kagaz, Piya Ka Ghar, Bawarchi, so basically a lot of Hirikesh M, Jaya, Sanjeev Kumar…. Sophy/Shalini: Liked Phagun as well, Dharmendra & Waheeda & a bit of Jaya = not bad at all! I love Zanjeer too, and also Zameer. It’s a little easier from a distance to vary the diet of these films—I also really love Mili, Koshish, Bawarchi, Piya Ka Ghar. But my taste in “over and over” obviously runs more to the crazy :) I wouldn’t want to ONLY watch films like that, but it is a decided preference most of the time. Variety is the masala of life! I can understand you enjoying them. Anyway, I think films reflect the country in a way, it seemed that in the 60s there was a still a choice towards which road we might take, and in the 70s it definitely went the whole hog down one path, despite the some small voices of sanity saying, think about it !! My list would definitely have Pakeeza way up there. May just add Hare Krishna Hare Ram, Mere Apne and Kitaab for consideration too. i was 6 yrs in ’74 and started seeing movies. All this stuff provokes nostalgia. You have missed ‘Charas’, Kala Pather, Des Pardes, and Kalicharan. thank you so much for your understanding and support. All the best. Superb, i have been searching for a blog that provides first rate writing concerning bollywood. I love classic bollywood and hate the fact that bollywood is changing and becoming hollywood. The chorography, the unexperimental direction, the over the top dramatic acting, perfect combination melodrama, the music and the good old cliche pulp story line served with a pinch of freshness. A movie like Musafir, Kaante, or the recent 3 idiots and my name is khan is alternative cinema not bollywood. true, i also like raju hirani films specially the munna bhai films. They are very filmi. after what you said, classic bollywood did have a lot of social commentary, and 3 idiots does try to do that. In Blackmail , the usual popular and more noticed song is – Pal Pal Dil Ke Paas, but one song which is even more passionately feely romantic was – MILE DO BADAN…the song is more psychologically complex, has sensuality, passion, depth, longing, sweet pain of love, union everything in it…and DHARMENDRA GAVE SOME REALLY GREAT EXPRESSIONS SUITING THE SONG PERFECTLY AND INCREASING THE VISUAL APPEAL TEN FOLD and made our breathings heavy with romantic sensations…it was thirsty, passionate, loving, longing and matured at same time just like the great lines of the song…(all this while doing nothing, only lying there in a dangerous situation, close by, dharmendra holding closely the a foot of Rakhi…)!! YEH ZINDAGI KAM HI SAHI…KOI GHAM NAHIN !! Read my review of Blackmail—I swoon as you do over that song! :D It is the most sensual song ever! I still like Pal Pal Dil Ke Paas better, but they are both seriously wonderful :) And the songs combined with Dharmendra’s and Rakhee’s beauty make it a film like no other! Dharmendra is my all time favourite and I am glad to see quite a few movies of his listed here. Pratiggya (1975) is also another movie which would be in my favourites. Dharmendra successfully established himself in the comedy genre. If you have not already published your 60s favourites, do so as I am keen to read it up. Have you watched Kanb Kyoon aur Kahaan in 1968-69 release? It is a beauty of murder Mystery and he plays a dashing CID Inspector with love interest as Babita who actually manages to look cute in this flick. A murder…Dead body in coffin…Things that go bump in the night… all driving the hapless heroine insane and the CID go round in circles..Manages to hold viewer interest till last scene..If you havens seen it, the time is NOW! Sorry a typo..KAB? KYOON aur KAHAN? Hi Nagesh, Yes, I’ve seen Kab? Kyon aur Kahan (1970) since I happen to be a big Dharmendra fan myself. He was the one star who has withstood the onslaught of so many superstars – Shammi, Rajendra, Rajesh and Amitabh. I have read somewhere that he was one of the three Ds – the other two being Dilip Kumar and Dev Anand – who was in demand between 1969-71 when Rajesh Khanna was at his peak. The demand of Shashi Kapoor, Jeetendra, Sanjay Khan and so many other heroes just dwindled to almost nothing during this period. So, that makes it all the more special for me. Of course, if Dharmendra had made his debut as a leading man in the 50s, I am sure he would been able to hold his own against the then top trio – Dilip, Raj and Dev. Incidentally 1970 happened to be many firsts for Dharmendra with regard to his heroines. He acted opposite so many leading ladies for the first time this year. Babita, Sadhana, Rakhee (her debut) and finally….you guessed it – Hema Malini ! Hema’s debut film was with Raj Kapoor – Sapno ka Saudagar. I just saw Deewar for the first time today and I have to say I’m already obsessed! Amazing. Excellent choice. My version of “Pal Pal Dil Ke Paas”. Please give your feedback / comments on you tube page. I feel movies such as Sachha Jhutha,Safar and Hare Rama Hare Krishna should have been included in this list. Talash (1969) was one of the four movies for which SDB scored music in the 1969-70 period, the other three being Aradhana ,Prem pujari and Ishq per zor nahin each of which could be called an achievement in melody,orchestra and rhythm.Although Prem pujari and Ishq per zor nahin could not pass as commercial successes their music however surpassed and enchanted the listeners.No wonder many of the songs from these were selected for stage shows even recently like many OPN scores. Although SD scored few more movies till mid 1970s the class set up by these could not be matched and these years can be termed as the golden years of ‘his’ musical achievements. Can’t imagine Devanand being left out and dharmendra getting so much space.Chintu the only saving grace of 3rd gen kapoor and really coy for some couple of years is also ignored,Naveen nishchal had his moments in the decade and so had Vijay arora Manoj kumar was also present. I haven’t watched it in ages but as a child everyone in my family loved Pratigya (Dharmendra and Hema Malini). I’m not sure if it translates well but the world within which it is startlingly similar to Dushman. Also Hera Pheri and Do aur Do Paanch were great fun to watch, although Google tells me the latter is a 1980 film.